After the initial shock of how overgrown the plot was we decided to have a poke around in amongst the grass to see if anything of value had managed to survive the onslaught. What we found was pleasantly surprising. From the front of the plot it looked like a unkempt meadow as far as the eye could see but, after taking a little wander to the back, it wasn’t hard to miss one crop that was not only thriving but doing so well that no competition could compete. First discovery of the day – Rhubarb! These guys are massive! I don’t yet have the heart to cut any of them as they’ve survived so well, an attitude which is probably not well suited for an allotment owner. I’ve read in my trusty RHS guide that rhubarb should be not be harvested too late in the season so that it is strong enough to survive the winter, so I can assuage my guilt for now. The yellowing leaves will need tidying up and hopefully it should be back just as strong next year. 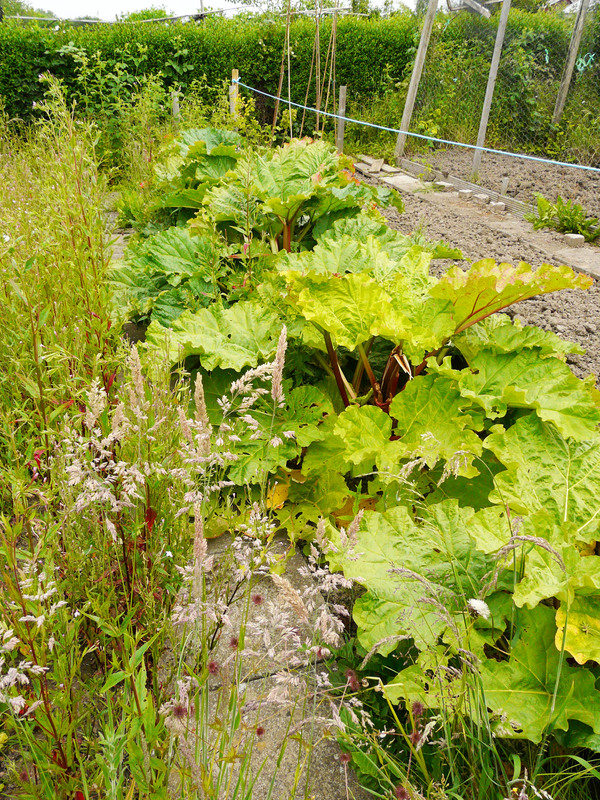 Unfortunately our plot ends where the blue string just behind the rhubarbs bed is, so that nicely tilled earth in the back of the picture is just there to taunt us. Across the path from the rhubarb is probably my favourite find of the day. 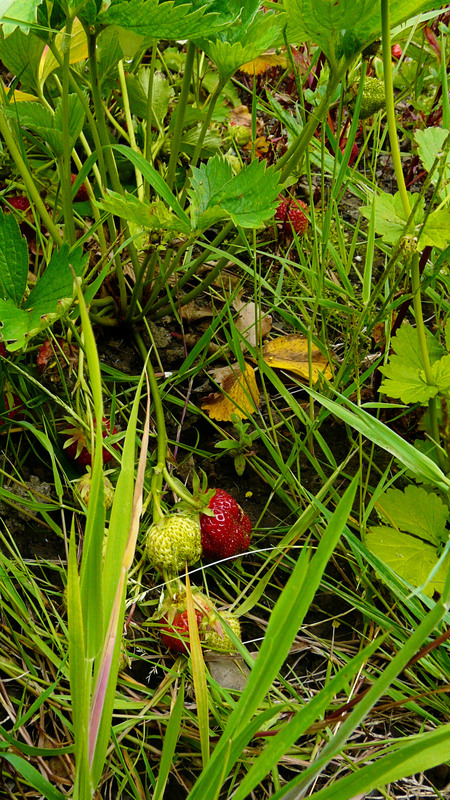 Snuggled in amongst the tall grass was a dozen or so strawberry plants. A lot of the fruit is still pale and I’m guessing that they haven’t had enough water to swell and ripen due to being left unattended all spring and early summer. 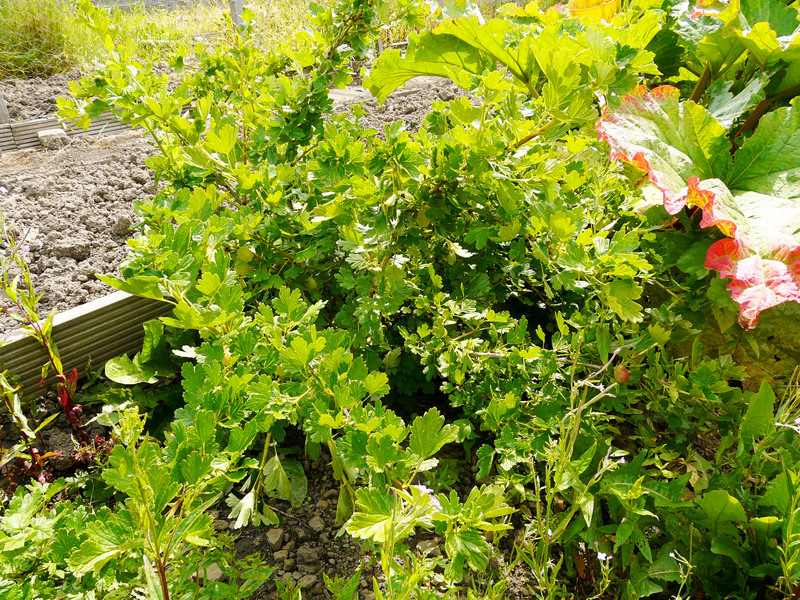 However, one advantage of all the weeds on the site is that it’s hidden a lot of the ripened fruit from the birds. We’re right next to woodlands and there’s plenty of fat pigeons hanging around but there’s a lot less damage than I would expect to find on un-netted strawberries and I’m guessing we have the tall grass to thank. Once we’ve had the best out of these strawberries we’ll root the runners into pots and then they will probably be dug up. They look a bit ropey and I’m guessing that they might be a few years old and I’d like to build a raised bed a little further down the plot which the runners can be transplanted into ready for next year. 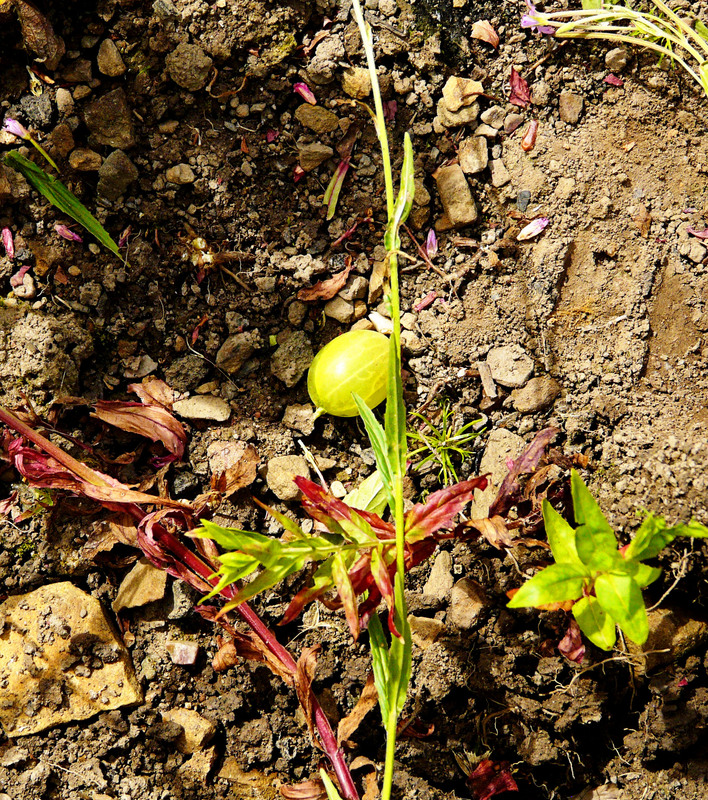 and where there’s a gooseberry there must be… gooseberry bushes! I didn’t spot it initially because it’s hiding behind the rhubarb. We have two bushes that look fairly well established and both have a reasonable amount of fruit. I’ll be honest in saying that I probably would never of thought of growing them if they weren’t already here as I’m not a huge fan of the taste but it will be interesting to see if that view can’t be changed now there’s a fresh supply of fruit at my disposal. Also, they’re already in the location of where I’m dreaming of building a fruit cage so they might as well stay for now. I’d like to see if these can’t be trained to grow a bit more straight as I’ve already been spiked when trying to inspect them. Down in the front corner of the plot were some posts which caught my eye as they looked like they’d been used as supports at one time. Sure enough they had been and the fruit they had been supporting was still there, raspberries. The bushes were being strangled to death by bindweed and could barely get any sun because of the tall grass but they were still there, still flowering and still fruiting. 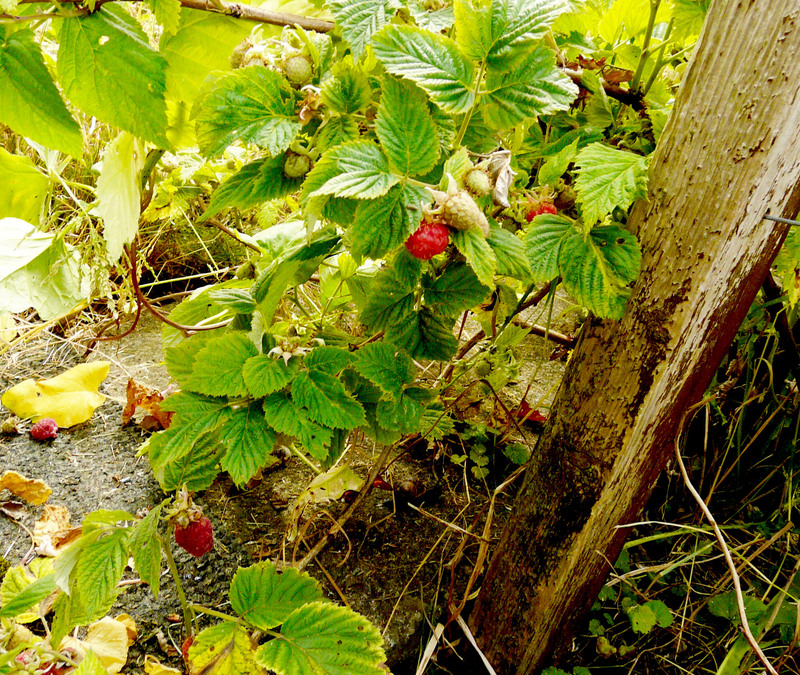 Upon further inspection it seems that at one time there were supports all along the left side of the plot with more raspberries growing just like this one. The new raspberry cane growth is running amok at the moment but at least its a sign that the plants are still thriving. The plan is to transplant some healthy plants to the bed opposite the gooseberry bushes, the area that will soon be incorporated into the fruit cage, and get them properly staked and trained. 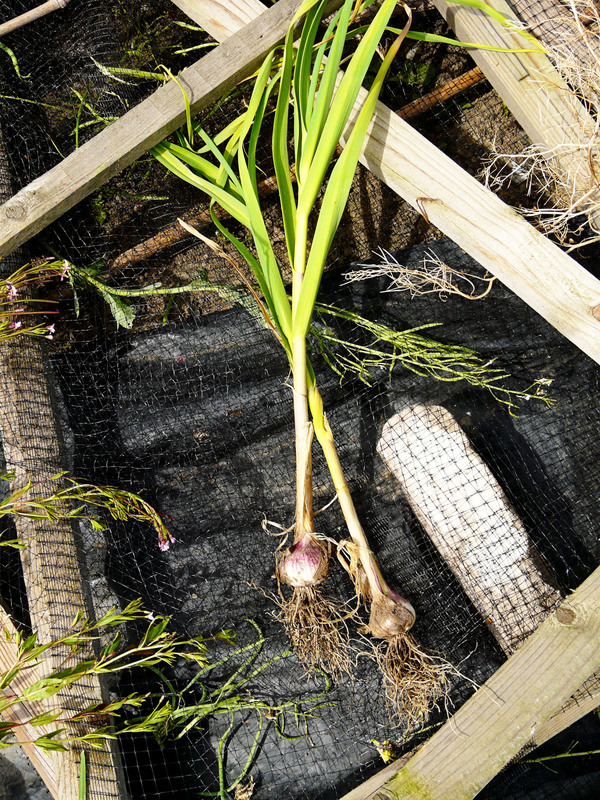 The last find of the day was these two garlic bulbs. One is a little damaged so we might have to see whether or not it’s edible but the other one seems fine. The smell that came off these was intoxicating, especially once they’d been laid out in the sun for a few hours. I definitely have the buzz for getting some crops of my own in the ground now and can’t wait to get cracking on with the weeding. Hopefully we should have at least one plot ready for some late brassicas if nothing else.